1. Woman drives into the homecoming parade. 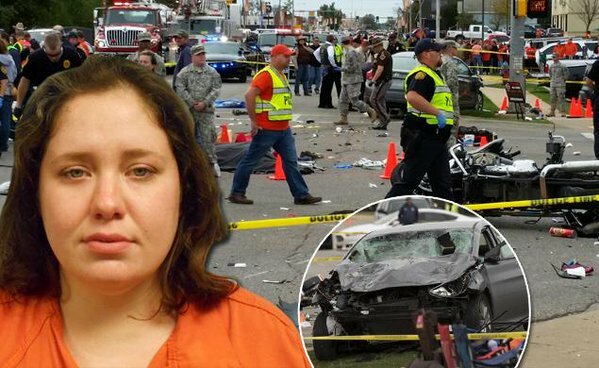 In Oklahoma last October, Adacia Chambers drove into an Oklahoma State University parade crowd. She killed three adults and one 2-year old and injured 47 more. The 25-year-old faces four counts of second-degree murder and 46 charges of felony assault. She could face life in prison if convicted on all counts. While alcohol was not a factor, she allegedly had been driving under the influence of drugs. 2. Young man kills 17-year-old senior before school year begins. In Charleston, South Carolina, James Bryson Munn struck and hit Kylie Gillette’s SUV in July. Per reports, she had been driving the speed limit and wearing her seatbelt when his speeding vehicle plowed into hers. Gillette died instantly. Munn, 20 years old, pleaded guilty to felony DUI, and he will spend 14 years in prison for his actions. His BAC tested to be almost three times the legal limit in testing after the accident. His mother described Munn as a sweet person who did everything his parents asked. He made just one terrible, life-changing mistake. 3. Twenty-three-year-old killed three in New Mexico DUI crash. Jacob Jaramillo allegedly ran a red light in November, striking another vehicle, flipping it, and killing its driver and three passengers. He faces charges of vehicular homicide, aggravated DUI, and running a red light. The young man allegedly admitted to drinking at the scene, telling law enforcement personnel that he had one beer before the accident. He pleaded not guilty during his first court appearance, and he faces a bond of $150,000 cash. This accident was not Jaramillo’s first DUI arrest.